Review based on the German edition by Schwerkraft Verlag. This will be one of those very rare cases where playing a strategic game might be faster than reading this review. And it’s not only because I tend to ramble! I mean, I do, but not that badly. The main reason is that the game in question is even called Eight-Minute Empire. Although, to be fair, eight minutes is the lower bound of play time, it may take as much as twenty full minutes, and then reading the review is certainly faster. 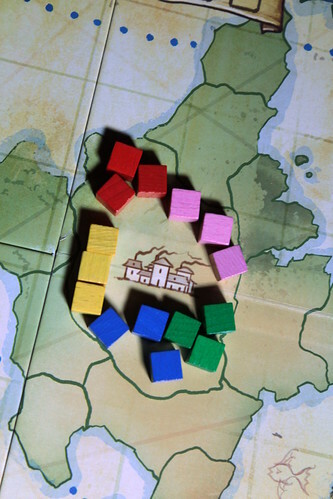 Anyway, my point is, Eight-Minute Empire is a very quick game. 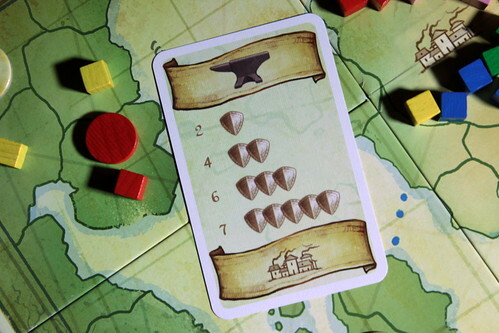 In this short yet strategic game by Ryan Laukat, you have to build an empire. Quite a job, considering you start with only three armies in the starting area shared with the other players and a few coins. Even worse, those coins are all you have for the whole game, there’s no way to earn more. And if you want to be the start player, you can kiss some of those coins goodbye already, because that honor is auctioned before the game starts. Once you have a start player, everything happens very quickly. On your turn, you pick one of the six action cards next to the board. The first card in the line is free, but if you want one from further in the back, that can cost you up to three coins. The cards have two functions: one, they let you take an action and two, they count as goods that score points at the end of the game. The fun dilemma of the game is picking the right card. Ideally, you want one that has the type of goods you collect and an action that helps you and doesn’t cost three coins, because you most definitely can’t afford that every turn. In this sad and annoying place called reality, you won’t usually find that card. The actions are quickly explained as well. You can move your armies a number of regions on the gameboard given by the number of cubes on the card. 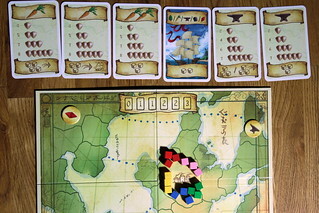 The regular movement only works on land, but with a ship on the card you can also use the shipping routes between the continents. You can build a city in any region where you have an army. You can recruit new armies in the starting region or in any region where you have a city. Or you can remove one army cube from any player, anywhere on the board. Some cards even let you do two of those! The game is over after somewhere between 13 and 7 cards per player, depending on the number of players. That is not a lot of time, especially with five players you basically have time for one campaign across the board before you start counting points. If you’re lucky, you get the chance to take Move across Water – Build City – Recruit – Move Across Water – Build City – Recruit. For your position on the board, that’s pretty much the holy grail of this game. But fortunately, your board position is not everything in this game, you also have to consider your goods, and you’ll rarely find the perfect sequence of cards with the right goods on them for you. Also, your opponents are unlikely to just let you have all the cards you want. When all the cards are taken, you count points. Even that is quick. Whoever has the most armies or cities in a region controls it and scores one point for it. Whoever controls the most regions on a continent scores one additional point for the continent, regardless of the continent’s size. That makes the small continents with only two regions ridiculously popular sometimes. Finally, you score points for your goods. The more you have of one type, the more you score. Of the most common goods – carrots – you need three for one point and eight for five. But the rarer a type of goods is the more points it’s worth, up to the crystals that score one point for one, up to five points for four. Also figuring into the final count are the goods markers that are placed on the board in one variant of the game that I highly recommend you play, because it gives you one more thing to consider. Those markers go to the player controlling the region. Having multiple things to consider is the appeal of Eight-Minute Empire to me. The game is anything but complex, but for each card you take you have to decide between the ideal action, goods and price. You’ll rarely get all three in one handy package. On the board, you have to make a decision where you will expand your territory, where you’ll fight an opponent over territory and where you just let them have it and move on. Your turns are short, but making decisions is basically all you do: pick a card, take the action, next player. There’s a small element of luck involved in what cards are available on your turn, but it’s very rare that there is nothing useful. If you want to pay for it is a different question, of course, and one you’ll be considering closely after the first time you ran out of coins mid-game. I really only have one thing to criticise: I would have loved an overview over what cards exist. Especially in the later rounds, I sometimes wonder if the combination of goods and action that I would need next round still has a chance to show up. But other than that small complaint, I’m very, very happy with Eight-Minute Empire. Of course it doesn’t have the depth of a three-hour strategy fest, but that’s not the niche it wants to occupy. But for a game that plays in at most 20 minutes – and that number is pretty accurate – there are a lot of decisions to make, most of which aren’t easy because you can’t have everything you want on one card, and there is a decent amount of player interaction, too. And if you take it out of the slightly oversized box, Eight-Minute Empire can accompany you everywhere you might go.